It’s been shark month on Syfy and I love it because I really enjoy inane Syfy movies. Usually the goofier they are, the more I enjoy them and I seek out the ones with the crazy titles figuring they have the best hope of being the cheesiest movies (with bad acting and computer graphics even I might be capable of pulling off). Of course they had Sharknado 3 – Oh Hell No!, which was disappointingly stupid (and I went into it knowing it would be idiotic, but it was just too much and I couldn’t even finish it), but they also had classics like Zombie Shark (which lived up to its name, trust me), Robot Shark (UFO meets shark, it was great), Sharktopus vs Pteracuda, and the follow-up Sharktopus, both equally dimwitted movies. Needless to say, I’ve been having a ball with my guilty pleasure t.v. watching. Of course sharks are a popular “villain” in movies because pretty much everyone is afraid of sharks. And Syfy plays that up by making them even worse – they add tentacles and alien powers and have scientists turn them into mutant monsters that can take huge bites out of the Golden Gate Bridge. It makes for fun movies since Syfy is so completely over the top with it, but sharks themselves are amazing creatures. I love sharks and I hate sharks. I saw Jaws in a drive-in theater when I was young (I still harbor a grudge against my parents for taking me) and the scene where the head popped out of the sunken boat scared me to death. And of course (with no shark in sight during the scene) it made me afraid of sharks. I still am wary about the ocean but I’m not sure if that’s because of sharks or because I just don’t like the idea of swimming in a huge fish tank. At any rate, as I got older I grew to love sharks. I love the way they look, their history, the whole bit. They are fascinating animals. The only thing I don’t like is when I get suckered into a Discovery Channel t.v. show and see one eating a seal. But otherwise, I’m good. If you’ve got a smart phone…or even if you don’t, you can track sharks. Pretty cool, right? My daughter turned me on to this app. Now I have her giving me updates like Big Ben chiming the time throughout the day. Where’s Perth today? Or Ningaloo? What about Ningaloo!? For the love of God tell me he has pinged! 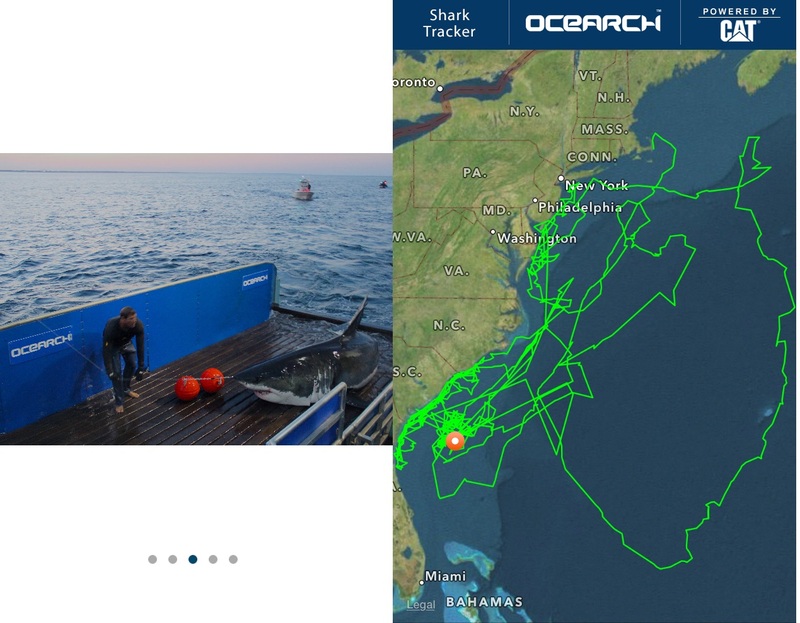 The OCEARCH team (OCEARCH.org) has tagged a lot of sharks to track their movements. 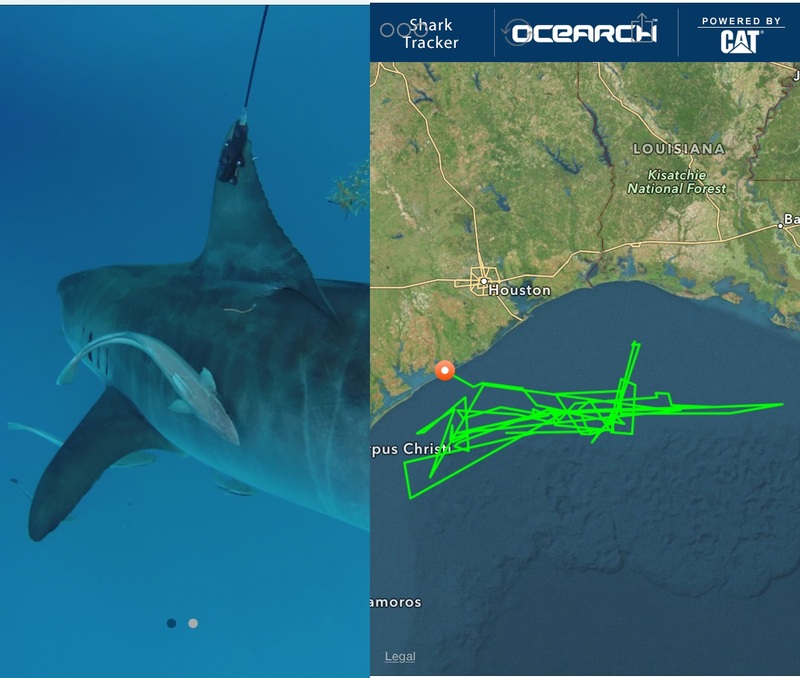 When one of the sharks surfaces, the tracker tag “pings,” letting people with this app (Global SharkTracker) know their location. 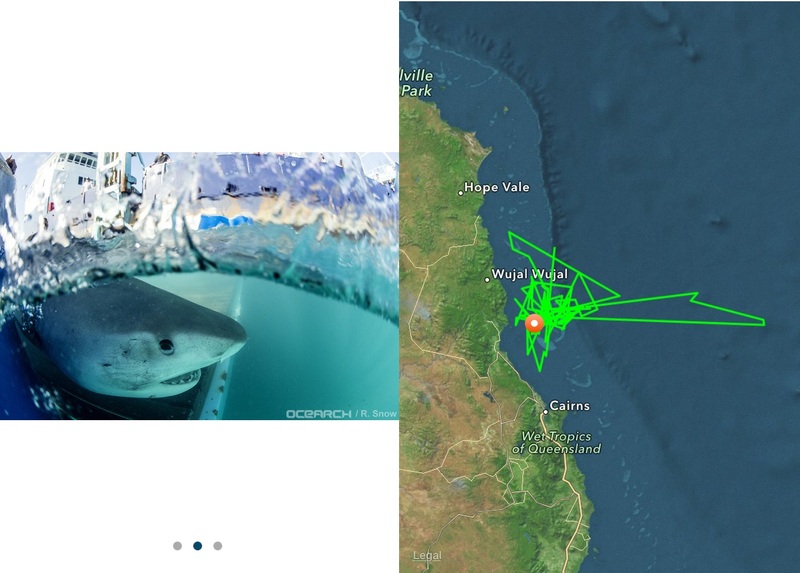 The app consists of a map of the entire world, with little dots identifying where the tagged sharks are. They offer the same thing on their website. You can track the sharks by name (from Adelaide, Al and Albert all the way to Wyatt, Yolanda and Zac), by their gender or their stage of life (immature, mature or “undetermined”). 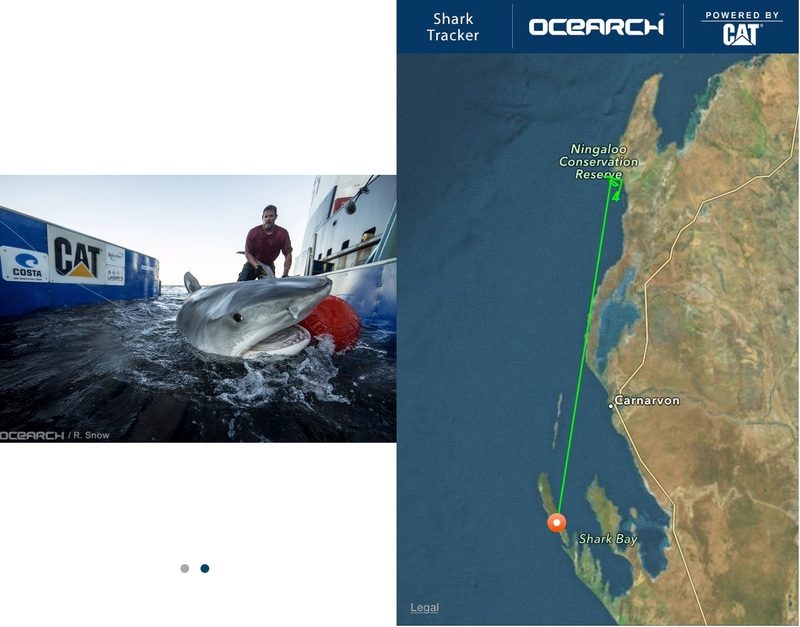 You can see photos of them and see details – their species, length, weight, the day they were tagged and the location where they were tagged…and even more cool, just how many miles they have traveled since they were tagged. Let me tell you, some of these sharks get around! Click on the “Where have I been?” button and you’ll be able to see the migratory pattern of each of these sharks. “Sharks be crazy,” to paraphrase Sheldon of the Big Bang Theory. And they seem to be! Some are ‘sharks on a mission’ – they go in an absolute straight line to get from point A to B…because they’re all business and no fun. No time for side trips. Then there are others that meander about in a very small area – they like it close to home and don’t want to venture out into the wild blue. And then…then there are the nutty ones. These are my favorites (of course, right!?). These sharks look like they’re on some kind of a major caffeine trip because they’re just all over the place. 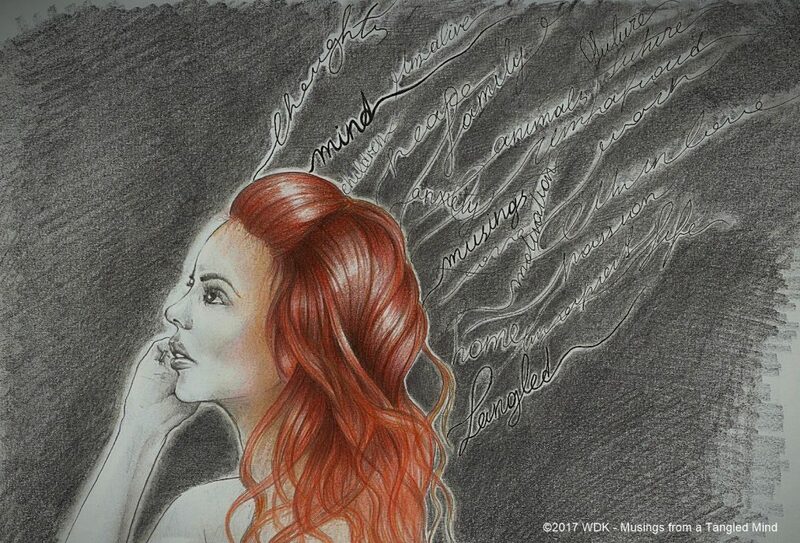 It looks like you gave a pen to a toddler and told them to draw some majorly complicated picture and you come away with this chaotic scribbly mess. I’ve chosen a few of my favorites to show you the different sharks and different patterns. So anyway, if you like sharks, like me, or are just interested in sharks, you should check out the app or go to their website (you can see the map and “pings” there too). I warn you though; it can be quite addictive to see where your faves are spending their time and waiting to see where they’re going to surface next.